Once a month I contribute a skinny dessert recipe to Dash Recipes. 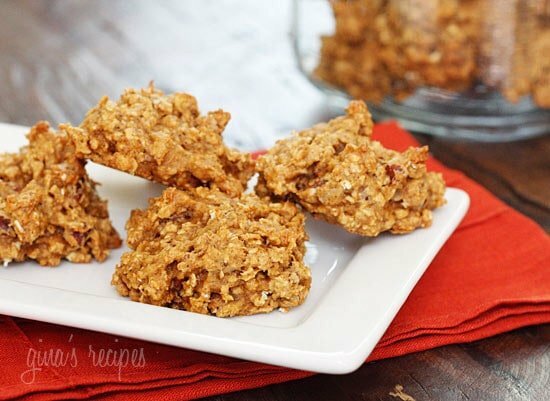 If you love a moist, chewy oatmeal cookie, you’ll just love these! 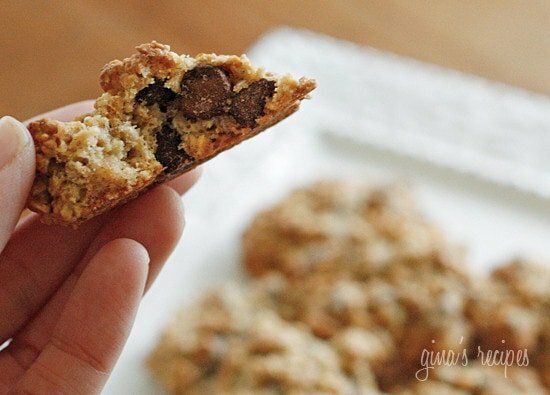 Under 200 calories, 5 Points+ and 7 Smart Points for 2 cookies. 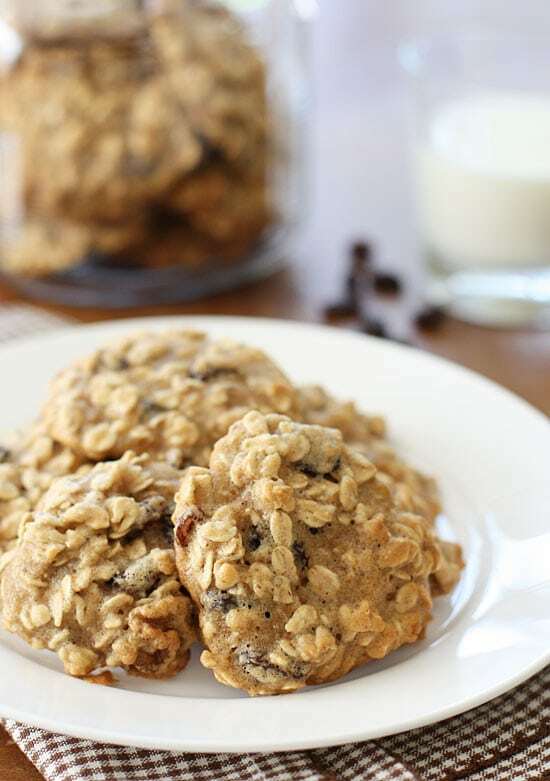 Please visit Dash Recipes for the complete Skinny Oatmeal Walnut Raisin Cookies Recipe. 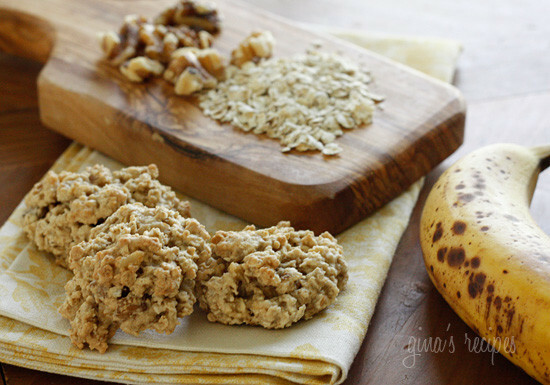 Hi Gina, I need to make a low sugar oatmeal cookie and wondered if I can back on the white sugar and maple syrup by 1/2, in your oatmeal raisin walnut cookie? These cookies are sooo good! My husband had no clue they were even lightened up! Made the Oatmeal Raisin Walnut Cookies this evening (without walnuts due to allergy). They turned out great. Before adding raisins, I split the batter and added mini chocolate chips then raisins to the other half. Both are delicious. I cannot wait to give these to my friend and her husband! Made these for a cabin-camping trip. They held up well in backpacks for hiking. They were tasty and chewy and did not dry out like some oatmeal cookies do once they are cooled from the oven. I liked that they were a much healthier treat that were more like an energy cookie because of the ingredients. I used pecans instead of walnuts and homemade apple sauce from our backyard tree last fall. This recipe is a keeper and I will make again. Yummy! if i don't have apple sauce can I leave that out?? Very yummy!This is one of my favorite recipes you've ever posted! So delicious and easy to make! I Will make it again! Looks like you have to click on a link to view the recipe. It is apparently not on this page. Seriously, I don't know which ones to try first! They all look so yummy!! I just printed out your recipe for the Oatmeal Walnut Raisin cookies and noticed or missed the part of the directions where it says to stir in the rolled oats. I'm assuming it goes with the dry ingredients but want to be sure. Thx for this healthy recipe, cant wait to try it! I made some Oatmeal Peanut Butter cookies this weekend! Yay for oatmeal! ZipList must be able to find a recipe's ingredients before it can be saved to your recipe box. I love walnuts in almost anything….these look delicious! Did you click on the link above? I just clicked and see it fine. would love to have this recipe but unable to see the actual recipe and unable to print it…. what happened…. help!!?? Just pinned! I'm excited about the pumpkin oatmeal! Fabulous! Thank you, oatmeal rasin cookies are my absolute favotie! Your cookies look amazing! Love oatmeal raisin cookies! Yummy!! I've been planning to do oatmeal cookies for a long time, this post gave me a huge incentive, thanks! Oatmeal cookies are my absolute favorite!